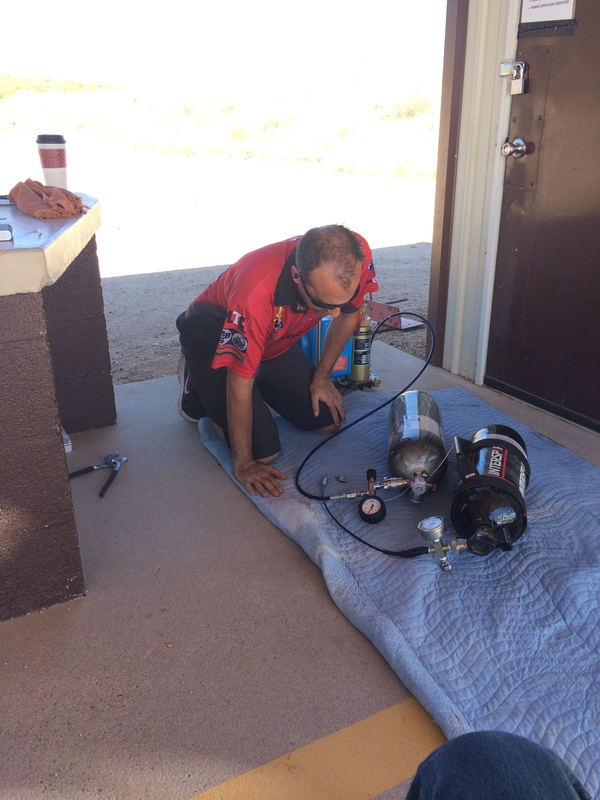 On Wednesday October 5th 2016 Doug Noble, myself and Tom Costan left the American Air Arms facility in Acton California to head out 7 hours into the Arizona desert. Our trip had not started as soon as we would have liked as our rifles had literally been just finished that morning setting us back more than 6 hours. I was very excited as this was my first widely followed Airgun event where I was sure to meet some very familiar faces. 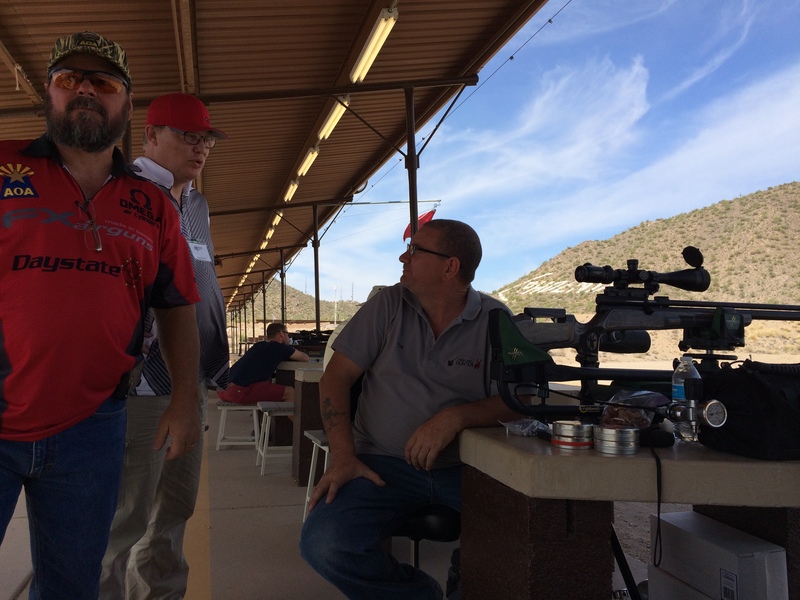 My goal was to do well in the Big Bore event and to hopefully place well in the small bore 75yard benchrest that was to be very challenging. 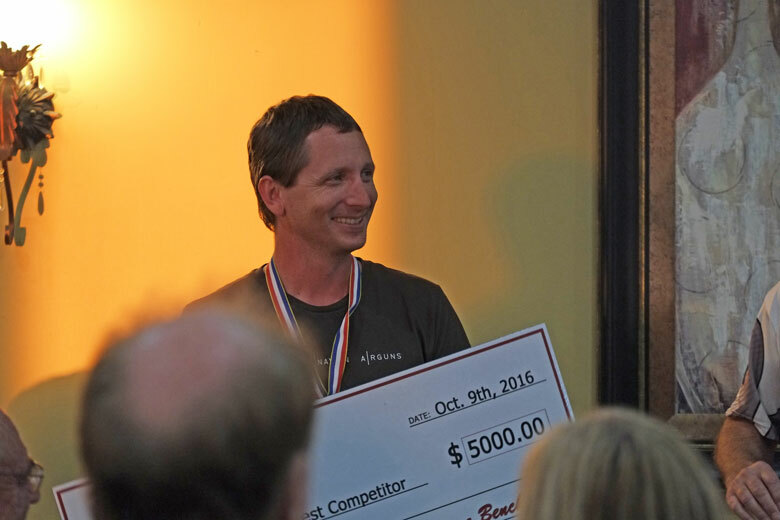 We arrived in Arizona early that evening where we settled in and made sure we had all necessary components to compete the following morning. 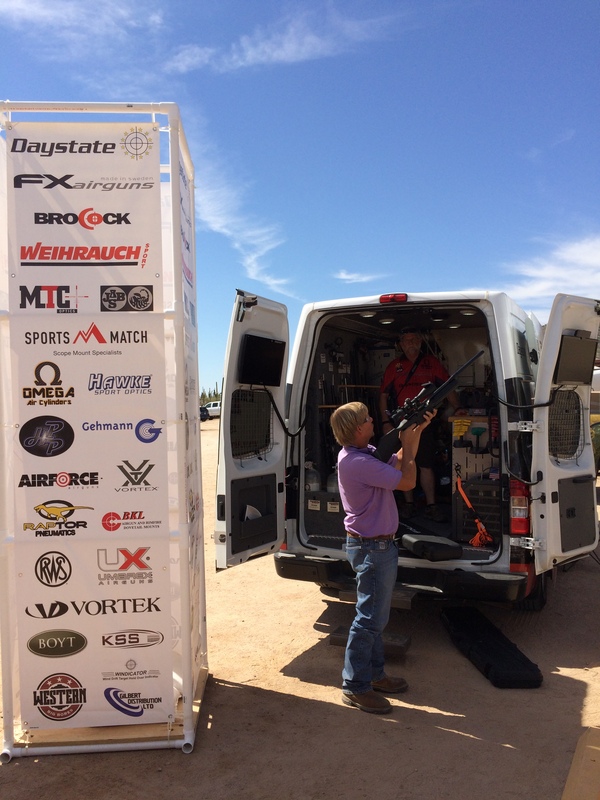 The next morning we piled into the van and made our way for some coffee before our arrival to the 2016 Extreme Benchrest event. 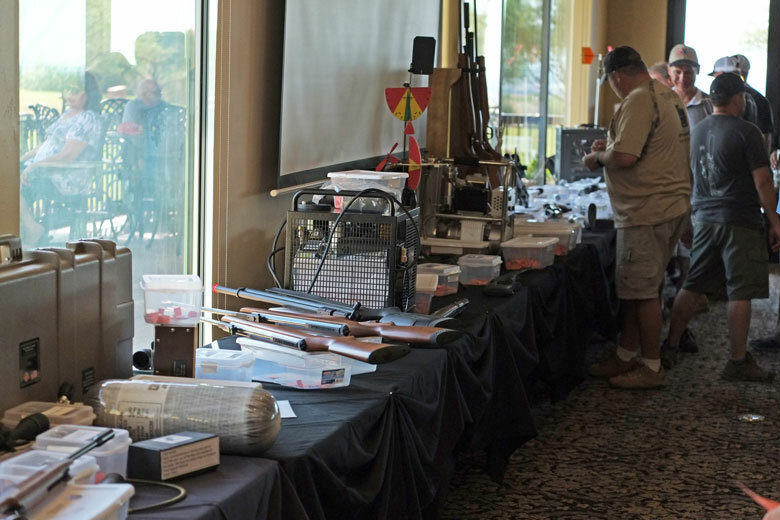 We pulled into the beautiful Rio Salado Sportsman’s Club by 7:30 am where we were greeted by banners and an army of Airguns Of Arizona staff diligently getting the event ready. 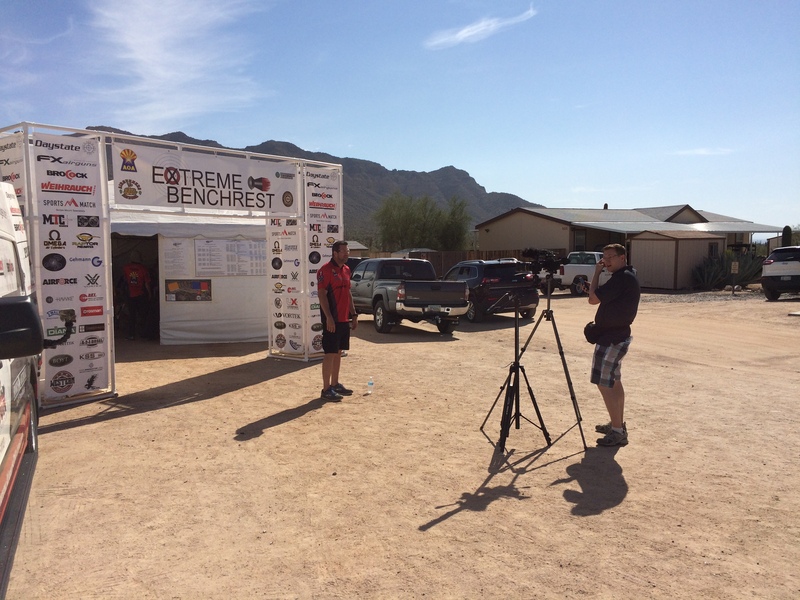 We made our way into the registration area where we were kindly greeted and given our time schedule that included a small bag of goodies along with an 2016 Extreme Benchrest T-shirt. 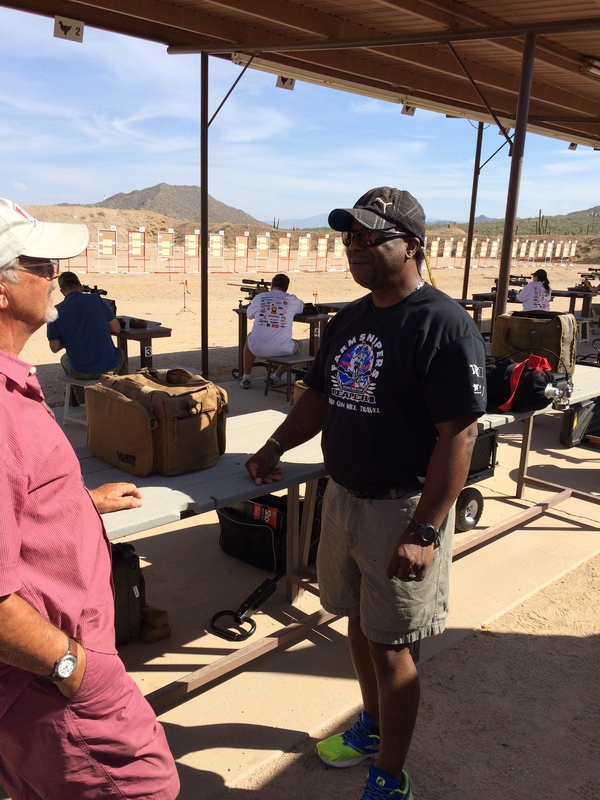 Tom, Doug and I were excited to get some practice in before our 1st afternoon Big Bore event. 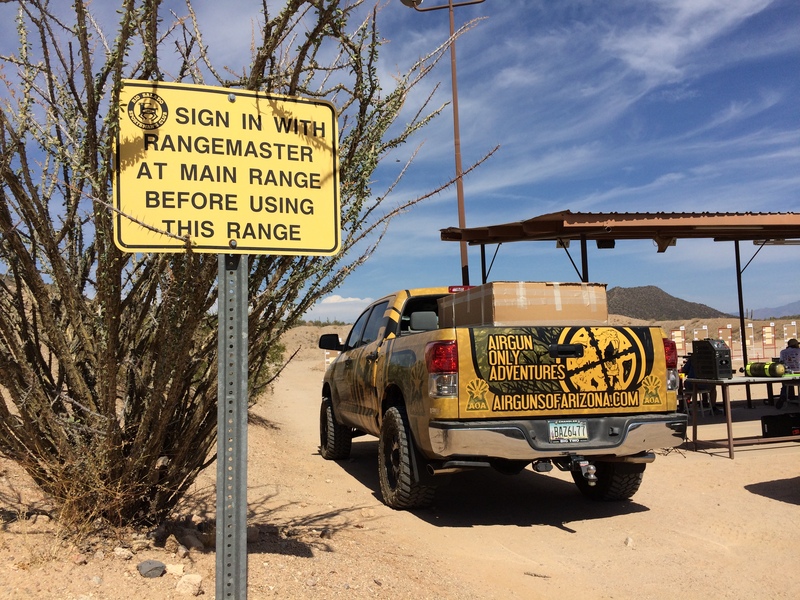 We unloaded our guns, tanks and pounds of other shooting equipment to the nicely shaded shooting benches. 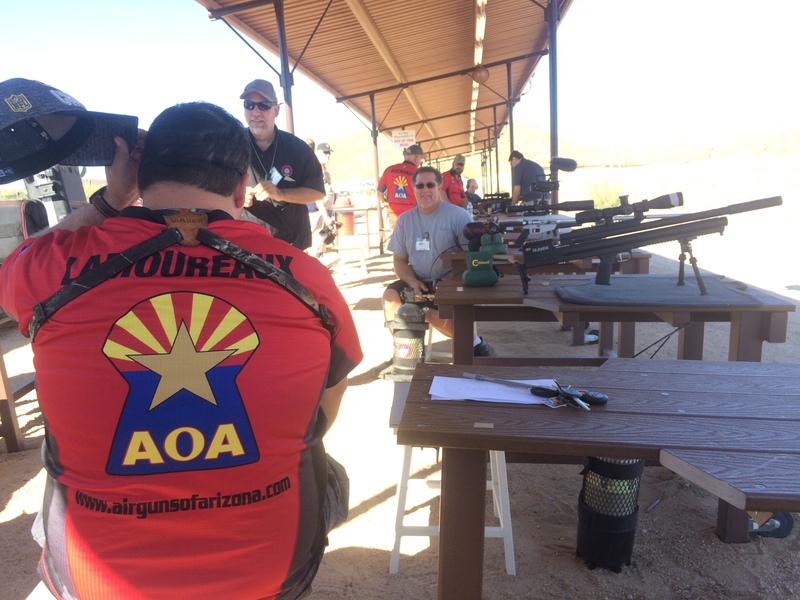 We were greeted by AoA’s own Kip Perow who later I found to be quite a great shooter in the Big Bore event. 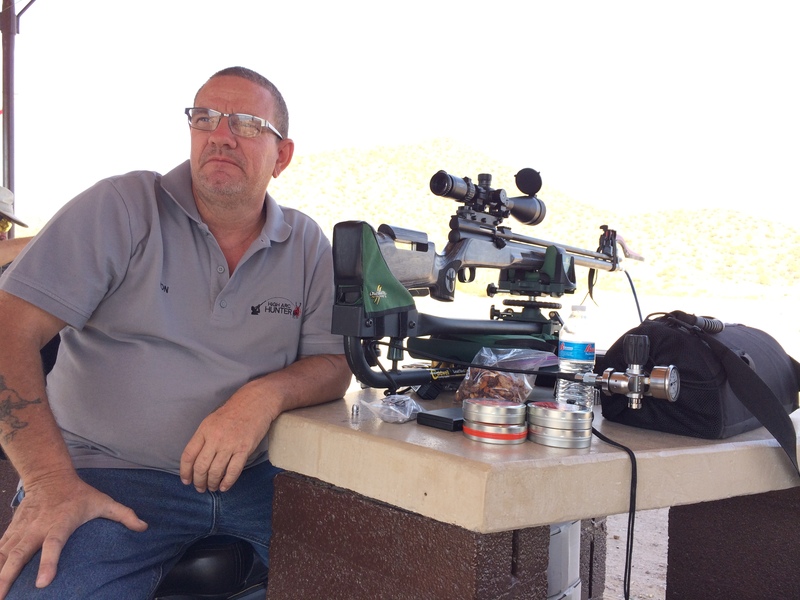 The man sitting was Ron from High Arc Hunting shooting the new Bushbuck .45 monster Big Bore rifle. 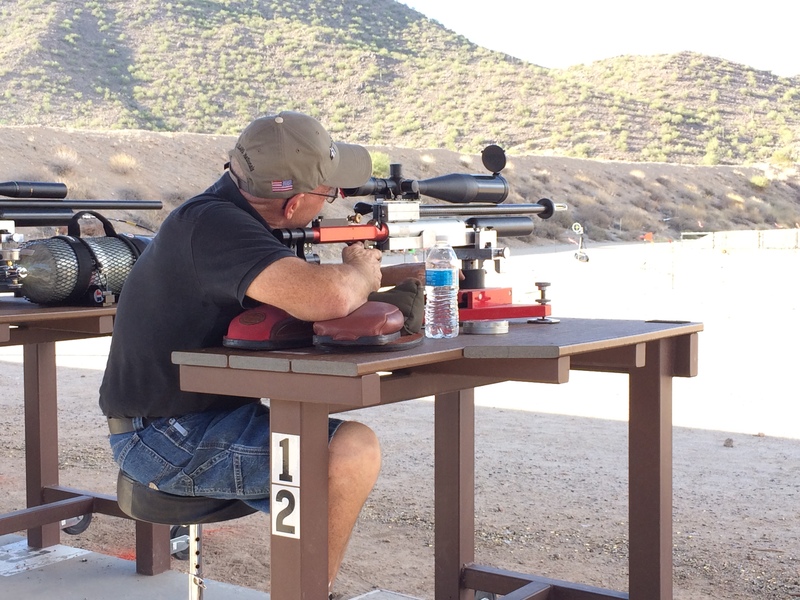 Doug Noble set up his custom built .338 that he has spent many months preparing to shoot here. Other well known names such as Rossi Morreale (below) from the show American Airgunner were practicing for the event. Tom and myself had a great talk with Rossi and were impressed with his love for the sport and his sincerity in trying to make it grow. 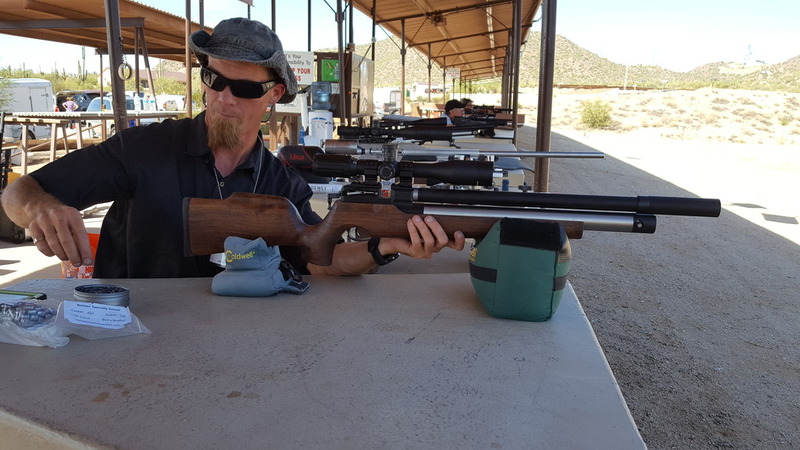 As Tom and I set up our new guns for testing we had Micheal Wendt (below) the new owner of Airgun Nation forum come by to say hello and to check out our new guns. Micheal is a very friendly guy that had some very positive energy behind him and one I was glad to meet. 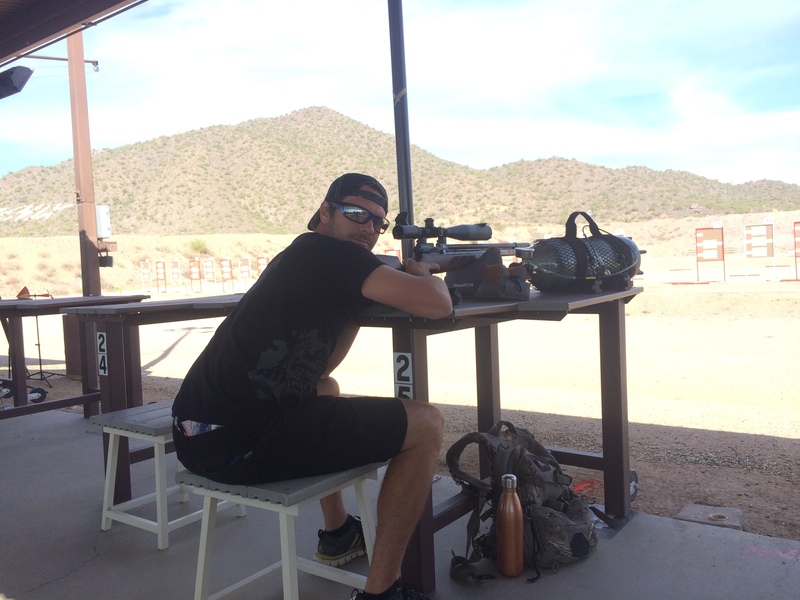 I was having a great time trying out my new wood stock EVOL .30 while Tom was using the .30 TAC version. 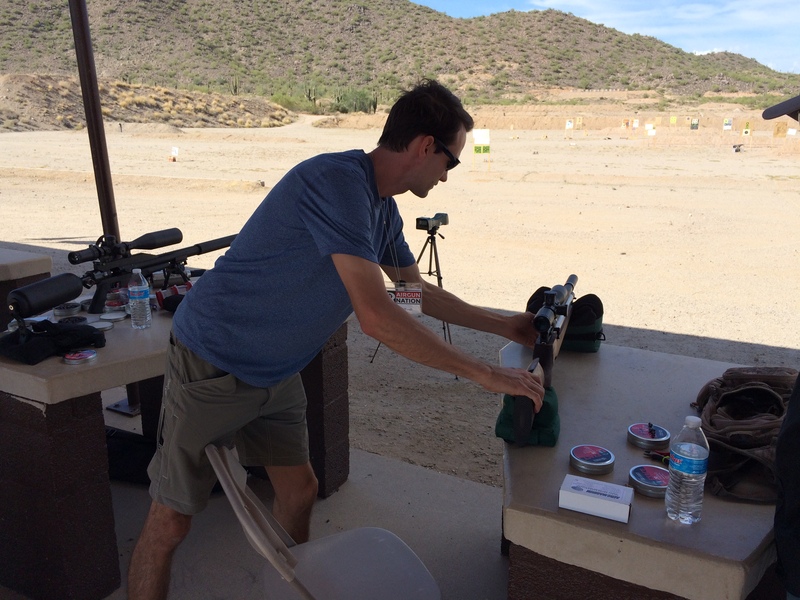 We were practicing with both of the American Air Arms .357 Slayers as well. For me it was quite the adjustment to switch between two completely different power levels. 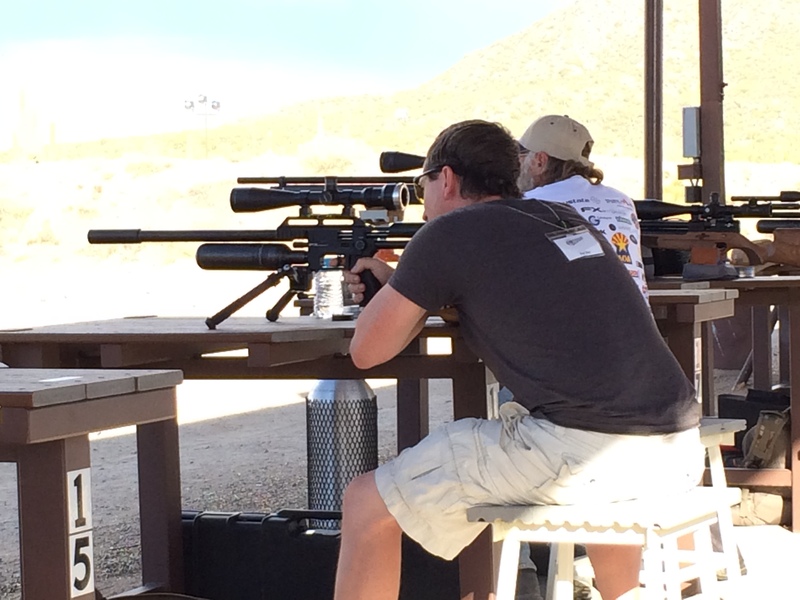 I was sighting in my .30 for the 75 yard event and my .357 Slayer for 200 yards. 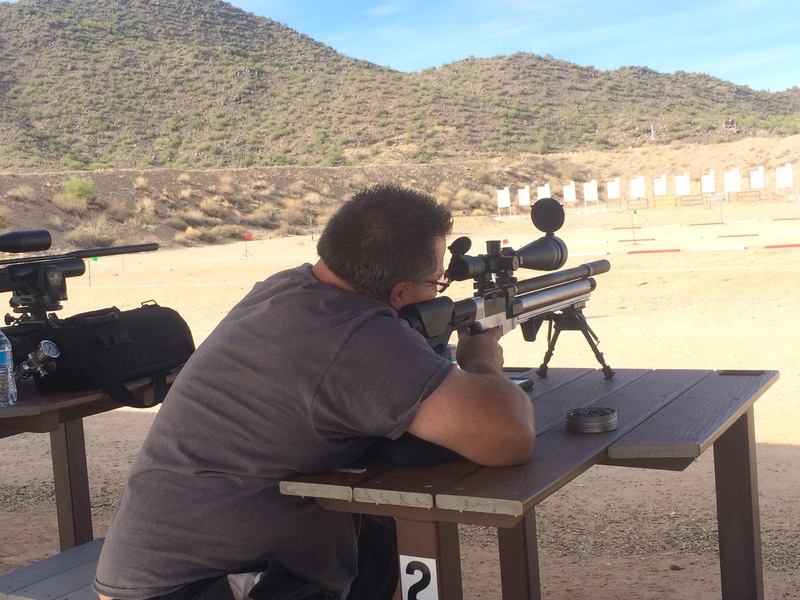 The rest of the day we practiced some more and walked around in between checking out some cool guns and even spotting a few more well known shooters such as my friend Tim McMurray of Mac1 Airguns and former winner of the EBR. Food and refreshments were available all day long with a great shaded area with plenty of room to sit and chat. 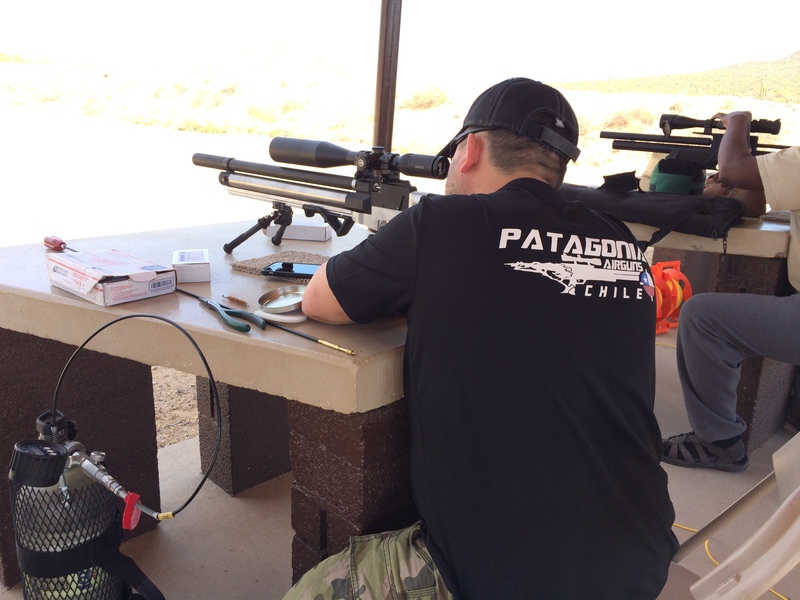 Precision Airgun was on hand with its mobile repair center as well as the onsite gunsmith. Day two for us was to practice till about 3:00 where we were to shoot our first 75 yard card. Day 3 we had or 2nd 75 yard card to shoot, all three of us were in the 3rd relay so we had a good portion of the day to practice. As I walked up to practice I saw another more familiar face such as Ted Bier. 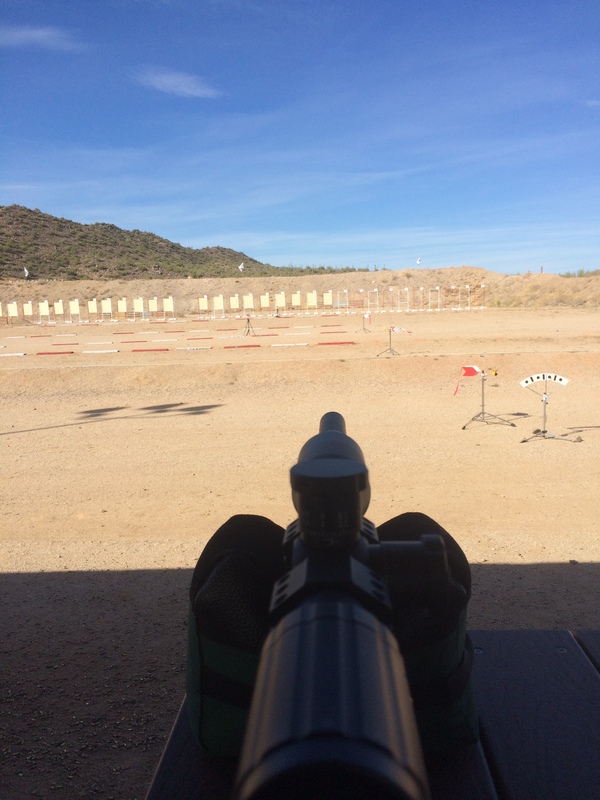 As the time approached I was feeling confident in my gun and my ability to shoot it well. We all headed down to our lanes to set our bench and to start the 75 yard event. I thankfully used a rear lead bag that proved to work much better for me, good to learn for future competitions. The wind was not as bad as the previous day but was still a bit unpredictable for me. 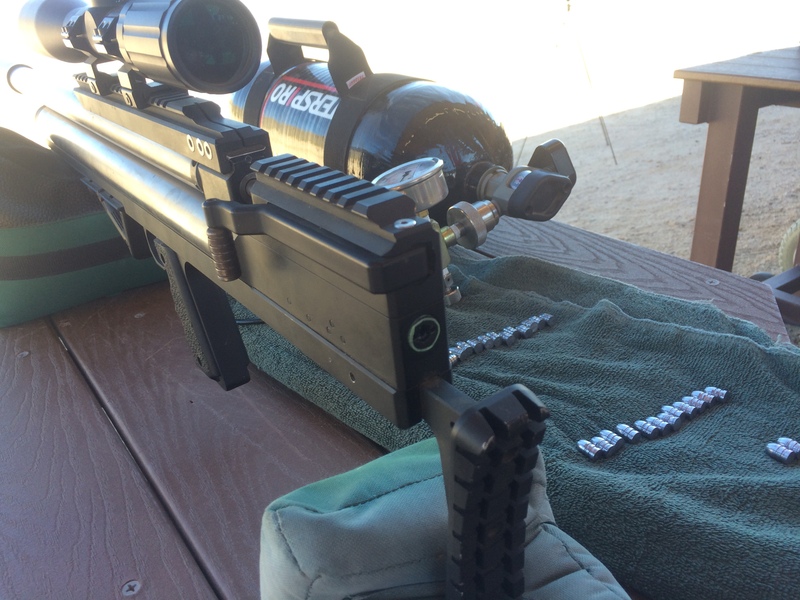 This time I used my sights as needed and filled my gun along with using sorted pellets. For me this was my personal best and was very pleased regardless of how I placed. As you can see, these are very small targets and very humbling when missed. Unfortunately as good as I had done this day my previous card had killed my chance to qualify for the 3rd card at 100 yards. 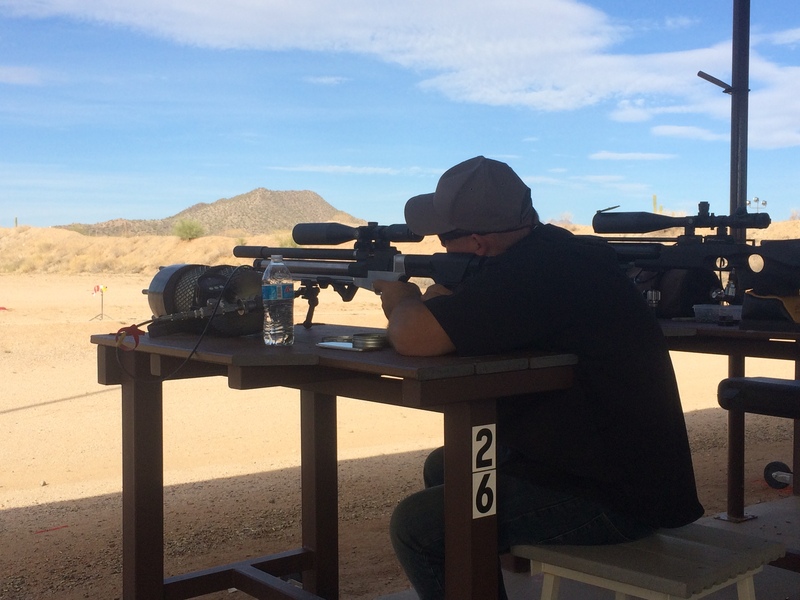 Day 4 started early for us as our Big Bore event started at around 8:00 where we would be shooting at 85 yards and 200 yards. I was pretty confident with shooting 200 yards but was a bit nervous of the 85 yards as I’m not used to having to hold under. Doug, Kip, Ron and Tom were all shooting great. That Bushbuck is a pretty amazing gun, Doug’s .338 is just plain radical. 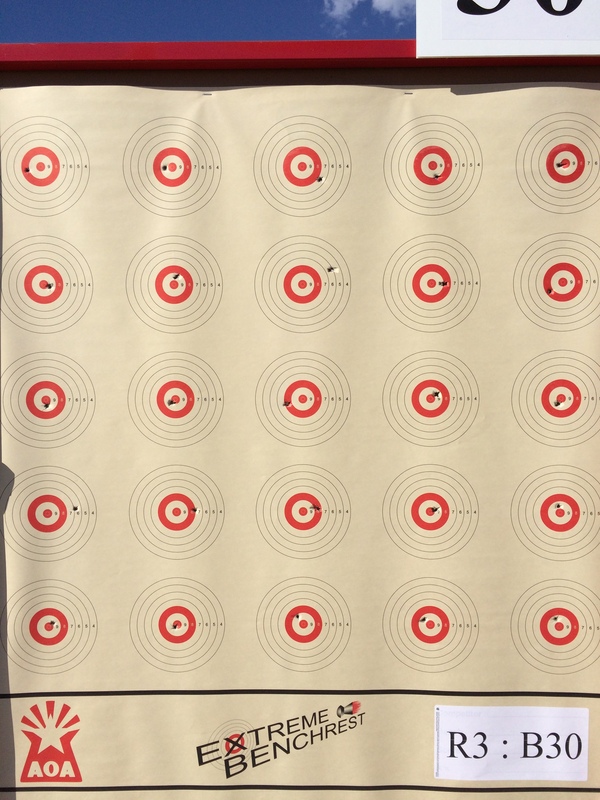 I had a bit of confusion with my 85 yard targets but in the end was very happy with a 2nd. 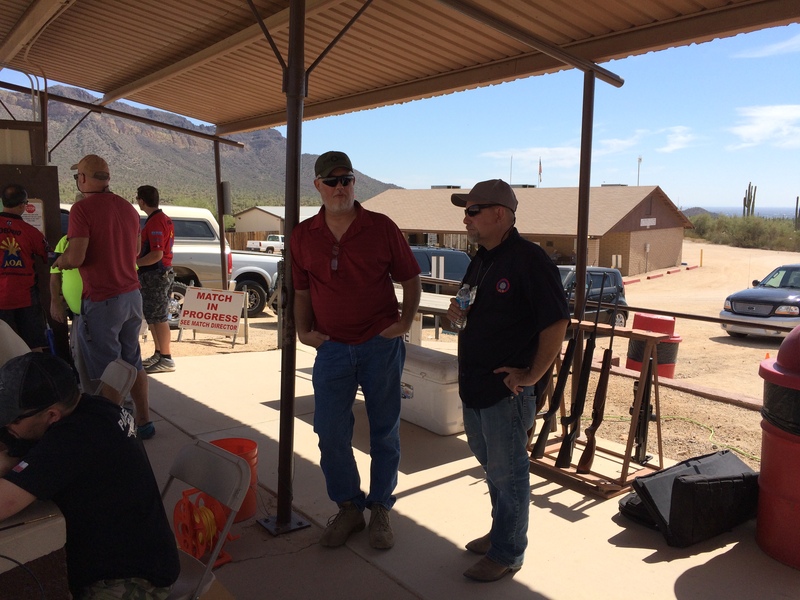 After the event we had nothing more to do till the banquet so we spent our time plinking with our guns and visiting friends. 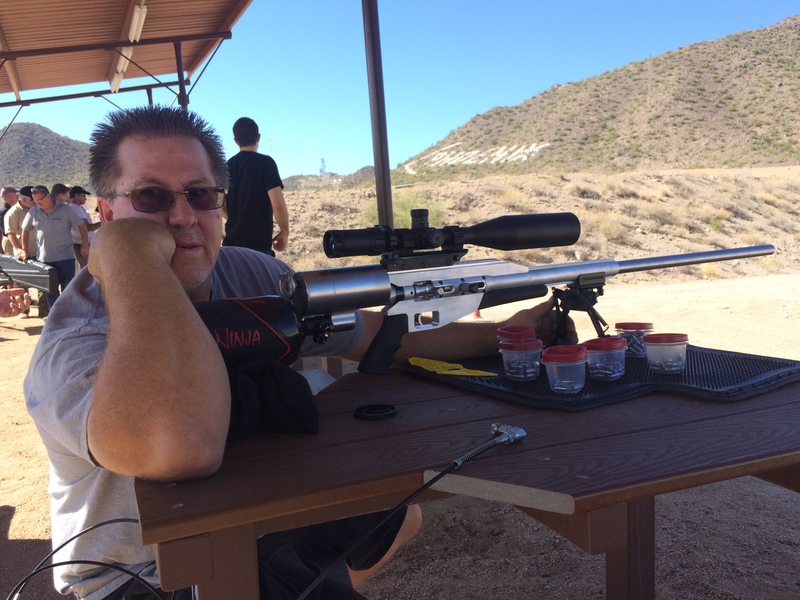 I was having fun offhand shooting the 200 yard silhouette while Doug was visiting the 550 yard silhouette with his custom .338. My good friend Jim Walton (below) from “Fun Birds Hunting” came by to visit and to do a bit of shooting with us. Had some more visitors from Chile “Patagonia Airguns” So nice to see people from all over the world, bringing some very nice airguns to compete with. My friend Steve Marsh (above) who lives in Arizona and came to keep us company and to show us some killer places to eat throughout the area. I cant wait to come back and do some hunting when time allows. 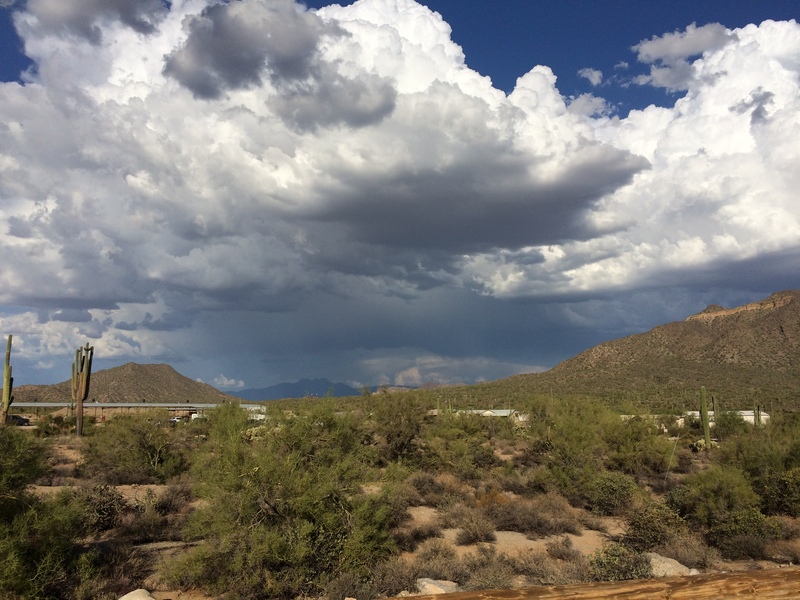 The day was just about to and end with a few Thunderheads in the distance. 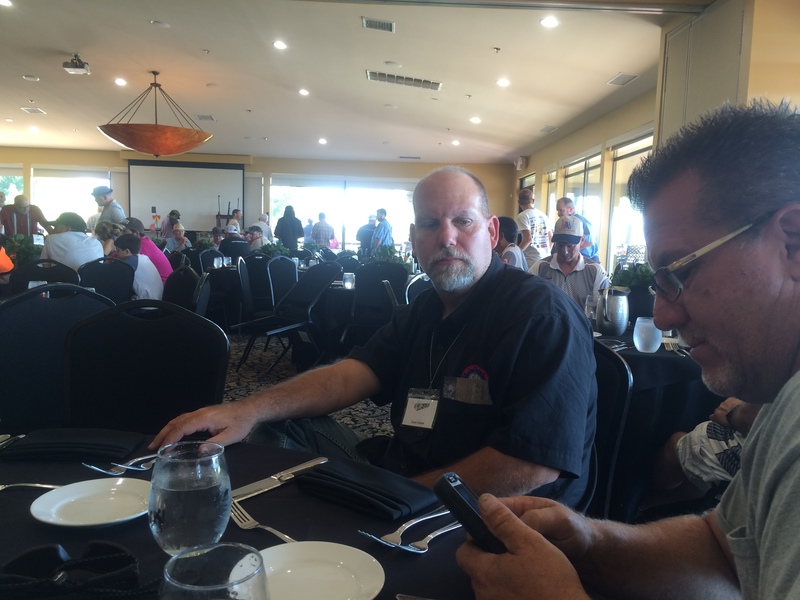 We headed down the road several minutes to a very upscale banquet hall that was overlooking a beautiful golf coarse. This is where we would have dinner, announce the winners and to draw for the raffle prizes. Some very nice raffle prizes this year. 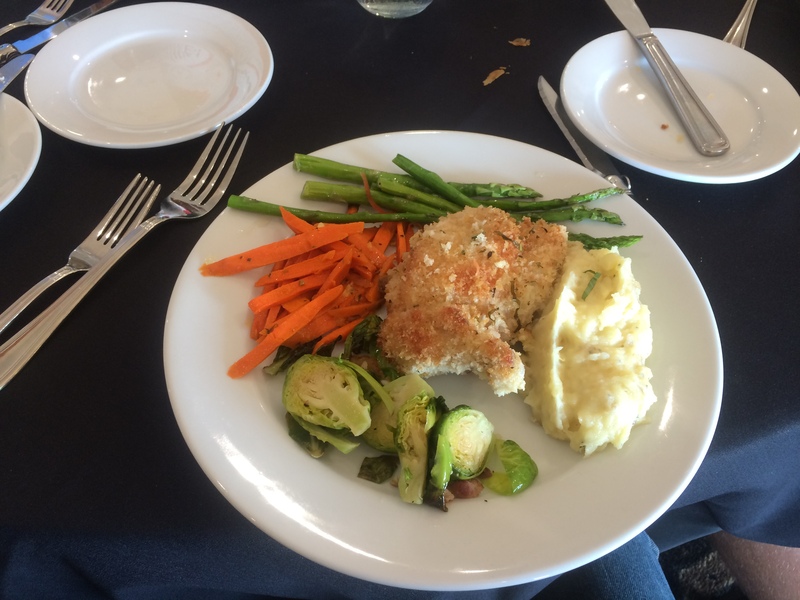 The dinner was excellent along with coffee and dessert, and followed by the awards.